"Sphynx" redirects here. For other uses, see Sphynx (disambiguation). The Sphynx Wrath is a Tactical weapon. The intention of this trap was to pay homage to a mythical creature known only for it's unparalleled mouse hunting prowess. Outfitted with a slew of clever traps it came as quite the surprise when the trapsmith who designed this tool of destruction found it utterly destroyed by it's own means, the statue untouched. It is believed the simple traps were insult enough to the spirit of this creature that they simply destroyed themselves in it's presence. The Sphynx Wrath is not sold by any Trapsmith. It can only be crafted given the proper ingredients. Chrome Sphynx Wrath - Crafted using Sphynx Wrath Parts and Chrome Sphynx Wrath Upgrade Kit. Smashing the Sphynx Wrath with the Hunter's Hammer produces Sphynx Wrath Parts. 26 March 2011: The first Sphynx Wrath was crafted. 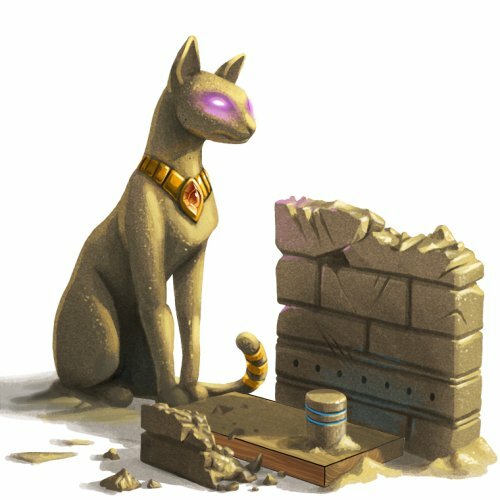 30 June 2015: The Sphynx Wrath was made smashable using the Hunter's Hammer to allow Hunters to create the Chrome Sphynx Wrath.